Our Family Wedding...Should be called Black Dowry. Imagine a young doctor falling in love with a young woman. He caters to her every whim, allowing her to lie to her family about their living arrangements, lie to her family about the length of their relationship and even lie to her family about her role in the relationship (as she is a volunteer teacher and not making any income) while her fiance supports her dream. Now imagine that young doctor heading home to introduce the woman he loves to his family and to be introduced to hers. Imagine that this young woman has neglected to tell her parents the " love of her life" the man she plans to marry is ...black. Sounds like it could be an interesting story or movie? Or is it more of a punchline to a racist joke? 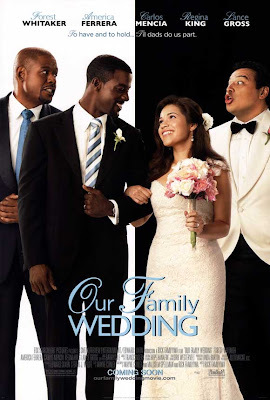 Today I saw the movie Our Family Wedding and I was extremely disappointed. Marcus a handsome, intelligent, young black man is in love with the pretty, intellectual, young Latina Lucia. They live together, they "love" each other and they plan on being married. While neither has introduced the other to their parents they plan on doing so. Marcus has told his dad about Lucia but she has not told her parents about him. And their family introduction is the movie. Our Family Wedding had an All-Star cast but was poorly acted at times. The premise of the movie was "Be ashamed you're marrying black" even if he is a doctor, even if he comes from money and even if he loves you. Our Family Wedding was typically racist, small minded and bigoted. Although you don't often see movies that include scenes with Goats taking Viagra. You won't miss a thing (besides beautiful shots of Lance Gross) in not seeing this movie which mind as well have been written by a goat. The message I got was if you are marrying black, they better come with a dowry. There better be compensation for "putting" up with their blackness. That love can be ashamed of who you are and it's still love. Be thankful,(if you're black) that someone non black wants you. The movie was a hot mess. A waste of Latin American and African American talent in a Hollywood film. But I am guessing that was the intention.